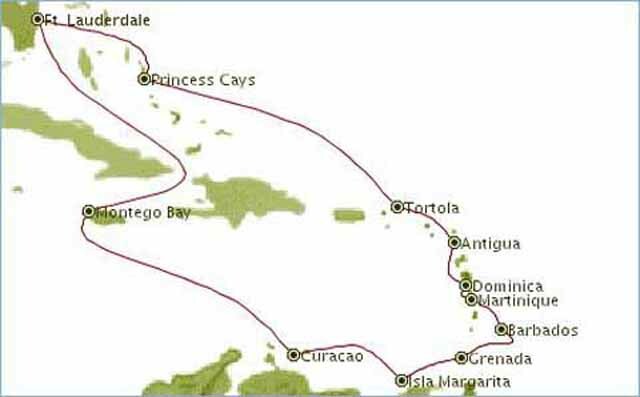 Princess called it their Grand Caribbean Islander. It was a combo of a little Eastern, a little Western and quite a bit of Southern Caribbean. An anxious cruiser waiting at Metro airport. A shot of one of the many canals around Ft Lauderdale while on my morning walkabout the day of our cruise. No, we're not on the Star Princess. It was just in port at the same time as our ship. The 17th St bridge opening to let some "poor" person through with their boat. The little dingy names Jo that caused the bridge opening. It's available for Charter. $100K per person (2 people) per week or $48K pp for 4 per week. Another shot of the Star Princess. It does day cruises out of Port Everglades. The Carnival Liberty. One of the more recent ships added to the Carnival Fleet. And there is our Sea Princess waiting for us to board. Holland America Zuiderdam I believe (back) and Royal Caribbean Enchantment of the Seas. And finally the Celebrity Cruises Summit. Long shot of the port. Looking West on 17th St. The Renaissance hotel where we spent our pre-night. Luann and Patty trying to decide how we're going to survive 14 days in this little room. Or such a small balcony. One lucky group heading to shore. Giving a lifeboat a test drive. Just a couple shots showing what Tortola countryside looks like. To be honest, not sure. Some large development off Tortola. Our pilot coming to meet us. Not a fancy boat but it will do. The pier where we'll be docking. Just a pretty sail boat. The ladies off on the hunt in the Craft Alive Village. Another shot of the craft village. Pusser's restaurant, bar, and gift shop. A couple small boats visiting Roadtown. Helios is 193 feet and charters for $395K per wk. Victoria Del Mar next to it is a 121 Footer. This old boat look as tired as I feel. This odd looking ship is the Easy Cruise One coming into port. Stanford built a huge cricket stadium. A shot you don't get much on a Caribbean cruise. An empty pool area. Just a shot showing the ship was built by the Italians. Now we're in Barbados. This is the Sunbury plantation house. Here's their web site if you want the full scoop. The front porch area. There was a nice breeze with all the windows out here. I'd like to have the room for a table like this. Looking at the front porch area again. I guess not really a porch, but I'm not sure what to call it. Typical small home on Barbados. Burial area just outside the church. The never smiling in photos wife. The Gun Hill Signal station. There were numerous of these on the island to signal each other of approaching ships or also for notification of slave rebellions. Not the best shot of the Lion. It was carved out of a single piece of stone by a British solder (Captain Henry Wilkinson) and military laborers in 1868. Our ship way off in the distance. Signal with the cannons. The Sea Princess is invading! We had the tour bus drop us off here in Bridgetown. Here we are in St George's Grenada. I believe this is Ft George overlooking the Harbor. Our ship docked in St George's as viewed from Ft Frederick. Ft George on the left. You could buy a banana from one of the ladies selling spices and feed the resident wildlife. I missed getting the shot, but there were locals diving off the top of those rocks into the pool of water at the bottom of the falls. A HOT day begins in Isla Mararita. The pier area where we tendered in from the ship. Our first tour stop. Tacuantar Village. Extracting the juice from sugar cane. Some dining on a piece of sugar cane. Here comes the Sun. Once again I'm out and about early. The blip on the right is a ship coming along behind us. The harbor entrance. Holland America beat us in. The employee area up on the bow of the Sea Princess. Can you believe it! Luann and Patty got up and out to watch us come into Willemstad. The ferry boat seen in the picture take you back and forth from one side to the other when the walking bridge is open. The bridge is closing behind us. It was SUPER windy. Getting a hand from the local tug. You can "ride" the bridge if you want. The blue boxes at each side are motors connected to propellers that move the bridge open and closed. Another shot of the inside. Built in 1853. The carillon. A carillon is the largest musical instrument in the world per the web page above. This one controls 47 bells in the top of the museum. Take a bit of muscle to play it. Just a view from the west looking toward the harbor. Looking out over the island. Another view of "Table top mountain". A phosphate mine. Chobolobo distillery, home of the authentic Curacao Liqueurs. Back in Willemstad. Another view of the famed brightly colored buildings. On the right is the "floating market". You buy right off the boats. Time to leave. Again, the wind prompted help from a tug. The walk bridge is open, so the ferry goes into motion. Another ferry loaded and ready. Easing up to unhook his line. Here we are in "Mobay". Montego Bay, Jamaica. Mobay way our last stop before arriving back home.